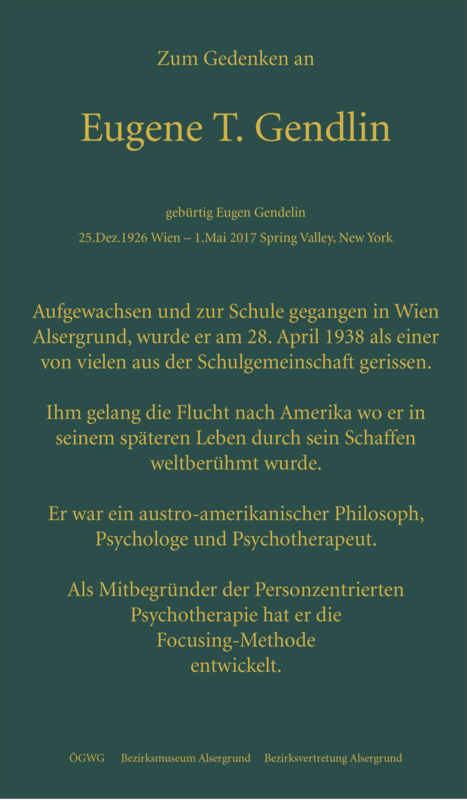 Lore Korbei, a resident of Vienna and a Coordinator with The International Focusing Institute, arranged for this plaque and ceremony, in cooperation with the Executive Board of the ÖGWG (one of the Austrian Societies for the Study of Client-Centered Psychotherapy) and especially its chairwoman Brigitte Pelinka. Lore was the person who interviewed Gene about his escape from the Nazis, the transcription of which can be found in the Gendlin Online Library. he was one among many torn from his school community on April 28, 1938. View the plaque here (in German).